I have been asked often how I execute the shoots which end up being shown as extreme macros in these pages, and in large prints. Today, I show a brief look at how I do this. Many photographers focus on the camera and lens, trying to seek out the most expensive or highly reviewed gear...but gear also includes the support system and the lighting. In my books, the lighting is probably the most important aspect. Then the camera support, and then comes the camera and lens. Get the first two correct, and today's modern camera system are so good that most, which can be set to Manual mode, and able to focus close enough will suffice. I use a humble Panasonic Lumix GH2 with the Panasonic-Leica 45mm Macro lens. Modest by professional standards, and very modest when compared to the camera I use for large prints - the Hasselblad H3D-39 with the HC120 Macro with extension tubes. Lighting is by Profoto. I uusually use the Profoto Compact 600 on an umbrella. In a studio environment, I would select either just the Profoto Reflector or a soft box, but for on-site and travel, the umbrella offers almost as even a lighting, and much more portable and easier to setup. The Compact 600 is an excellent tool, very even lighting, reasonably fast flash durations. Broncolor might be a better alternative, but for the price performance ratio, Profoto's Compact is tops in my book. A Pocket Wizard PlusII triggers the flash. I do not use a light box, as I find this end up in bland, uninteresting photographs. I prefer to use white and black flags to tune the lighting. This sometimes require a bit of trial and error, but experience provide the guidance so I don't have to try every combination. Sometimes, the bezel reflects the camera and lens...for a given camera angle, this is totally unavoidable, and has to be dealt with by the digital artist in post production. Supporting the camera is also critical. A strong, stable tripod is essential. The Gitzo 3540LS is my choice. Rock solid. For the head, which is equally important, I use a Photoclam Multiflex, a Korean made geared head, which offers 3 dimensions of adjustment. Built much like the Arca Swiss Cube, the Multiflex, in my opinion, is just as good. I bought it while it was much less expensive than the Arca Swiss, and when there was a constraint in the supply of the Cube, and I needed it for my grand US Tour in 2010. 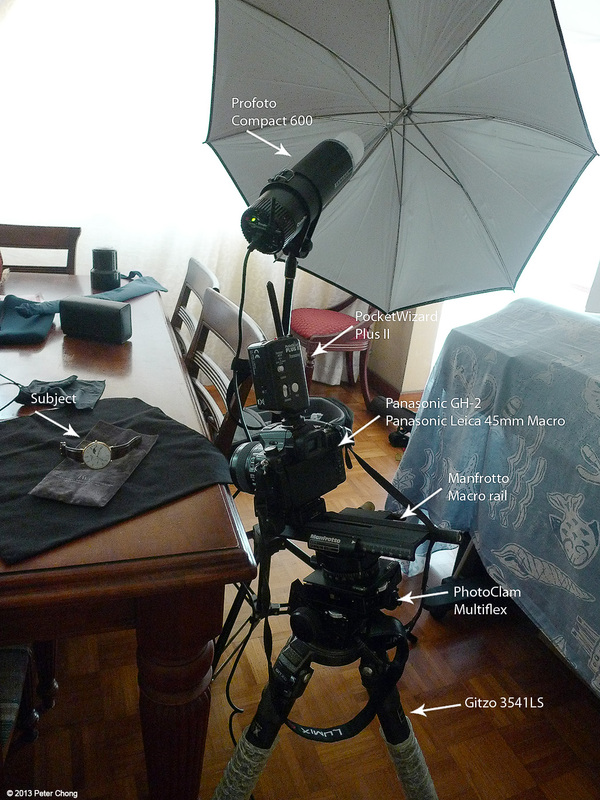 The Gitzo and the Multiflex cost more than the camera and lens. For stacking, I also use a Manfrotto macro focussing rail, so I can move the camera/lens in small increments needed for each photograph in the stack.